The Alma Aquaculture Research Station (AARS) is a state-of-the-art aquaculture research and development facility which became fully operational in April of 1993. The facility is the backbone of the Fish Production Research Program providing up-scale systems for aquaculture researchers at the University of Guelph and other institutions. The AARS has supported over 170 research projects since its inception. 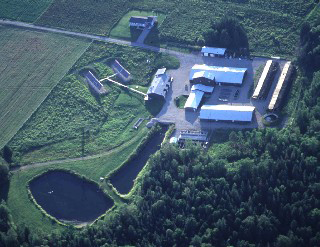 The Alma Aquaculture Research Station (AARS), located near Elmira, Ontario, is a state-of-the-art aquaculture research and development facility which became fully operational in April of 1993. The facility is the backbone of the Fish Production Research Program providing up-scale systems for aquaculture researchers at the University of Guelph and other institutions. The quarantine unit has successfully introduced Atlantic salmon and Arctic char and new strains of spring-spawning rainbow trout to the Ontario aquaculture industry. In concert with the Aquaculture Centre, various education and training programs have been developed at the graduate, undergraduate, college, and high-school level and have been very well received. Have a look at a SNAPSHOT of a few of the things we accomplished in 2018 ! The Ontario Ministry of Agriculture, Food and Rural Affairs, in conjunction with the Ontario Ministry of Natural Resources and the University of Guelph, established the Alma Aquaculture Research Station (AARS) to facilitate the development and commercialization of the fish farming industry in Ontario. The mandate for this state-of-the-art research and quarantine facility is primarily to address two main objectives. The AARS is a pre-production research and development facility to undertake studies relevant to primary producers. Secondly, AARS provides quarantine facilities for the controlled importation of exotic species or strains of fish, to assist the private sector with diversification, and the pursuit of new business opportunities. In addition, the AARS provides facilities for pilot testing and scale-up research as well as a venue for education, training, equipment demonstrations and technology transfer to the private sector. Last, the research station conducts tours to demonstrate aquaculture to the government and academic communities as well as to the general public. The Alma Aquaculture Research Station is located 37 kilometres north-west of the University of Guelph, and six kilometres west of the town of Alma. The property consists of 21.4 hectares of land. The 1.6 hectare fenced compound houses the station buildings and ponds and the remaining 19.8 hectares is comprised of hardwood and/or cedar bush and fields cultivated with alfalfa or conifers. The site was chosen because of it's high-yielding aquifer and proximity to the University of Guelph. The AARS consists of ten buildings and facilities with a total floor space of 2,616 m2. Administration Building - 3 photoperiod-controlled wet labs, a large wet lab, bench lab, offices and conference rooms, washrooms and equipment storage areas. Quarantine Building and Recirculation - 3 isolation/recirculation wet labs, office and a standby electrical generator. Hatchery Building - an incubation room and wet lab. B/C Lab Building - 2 wet labs, office and bench lab. Utilities Building - work shop, pole barn and feed storage room. Waste-Water Treatment Centre - for settling solids from the wastewater discharge. Outdoor Facility - concrete circular rearing tanks and fibreglass raceway tanks. There are 365 fish rearing units that allow for production and research on all life stages of fish, from egg to broodstock. Specifically, there are Heath-type incubators, 2m hatching troughs, 5m raceways, 6m raceways, a 10 m raceway, 0.7m semi-square tanks, 1m semi-square tanks, 2m semi-square tanks and 10m circular tanks. Source Water. The AARS is supplied with a continuous high quality supply of groundwater at a constant year-round temperature of 8.5 C. The AARS is permitted to take up to 6,370 lpm of water from a high-yielding aquifer. The water is oxygenated and degassed in the Water Treatment Centre before distribution to the wet labs and hatchery areas. Reuse Water. Up to 100% of the treated water can be passed through the Waste Water Treatment Centre and then pumped to the Water Treatment Centre and is used in the outdoor fish rearing units, after which time it is treated in the Wastewater Treatment Centre and the outdoor ponds prior to discharge into a receiving stream. This water reuse capability greatly reduces the amount of water that is extracted from the aquifer.